City Campus has changed dramatically over the past decade and will be unrecognisable to those alumni who graduated before 2005. The well-known Wearmouth Hall has gone, and been replaced by a state-of-the-art sports centre. The Campus is now one of the most up-to-date purpose built environments to cater for the high expectations of the modern day student. Academic areas covered on this campus include Education and Society, Applied Sciences and Arts and Design. Around £75m has been invested in City Campus to ensure it continues to offer one of the best student experiences in the UK. Priestman Building and the ‘new’ Sciences Complex, have undergone multi-million pound investment, to complement the new build CitySpace. CitySpace, houses a six-badminton court sports hall, 70 station fitness suite, sports massage and injuries centre managed by members of Team GB, multi-purpose room, indoor climbing wall, social, catering, leisure and exhibition spaces. 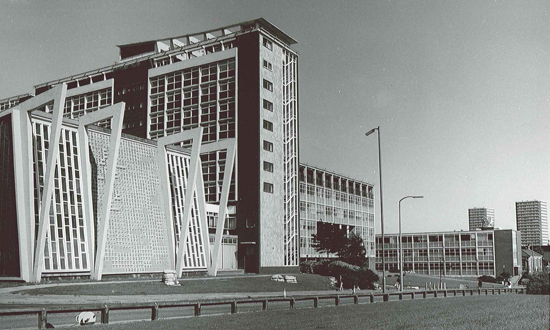 Wearmouth Hall was a much loved and well cherished feature of student life for thousands of Sunderland students over the decades. This popular hall of residence became a hub for student life (and love) in the City when it was opened in the 1960’s. Over eleven floors high, the residence towered above campus next to the Edinburgh Building and was home to a shop, canteen venue hall and of course student bar. Originally opened with 154 bed spaces for male students only it was heralded as a venue for a ‘united nations’ of Sunderland because of the many international students who stayed there. It was one of the very first halls of residence in the country attached to, what was then, a technical college.